Occupational therapy addresses occupations that fill a person’s day, and for our pediatric population this includes but is not limited to play, self-help skills, socializing, and learning. Our pediatric occupational therapy team works with children and families to develop the skills they need to be successful in their everyday life. We actively seek to strengthen the development of fine motor skills, visual motor, activities of daily living (ADLs), sensory processing integration, motor coordination, executive functioning, and feeding skills in the following contexts: sensory, social, behavioral, motor and environmental. Fine motor play involves the coordination of the small muscles in the hands. Developing fine motor coordination is necessary in order to complete specific hand movements while grasping and releasing objects. As the demands increase, fine motor coordination evolves into skilled manipulation of tools, toys, and clothes to improve a child’s play, writing skills, feeding skills, and dressing skills. Visual motor, also known as eye-hand coordination, is the integration between visual perception and motor skills. Visual motor skills are the basis for many children’s daily activities, such as catching a ball, coloring, writing, using scissors, and completing mazes. Activities of daily living (ADL) are tasks that we do every day. ADLs are most often actions that we take for granted, like playing with toys, brushing teeth, and dressing independently. However, many children have difficulties completing these activities. Occupational therapists determine the core problems that make the tasks difficult for the child. When should I introduce utensils to my child? Children should be presented with a spoon at 9-12 months to begin exploration during mealtimes and play. Potty training can begin as early as 18 months. However, you should watch your child’s cues (such as verbal or non-verbal communication that their diaper is wet or soiled) and ability to stay dry during the day. When should my child be able to write their own name? By the time your child enters kindergarten, he/she should begin to copy his/her own name. When should my child be able to dress themselves? When is it okay to introduce screen time for my child? The American Academy of Pediatrics recommends no screen time before the age of 2 years old. Sensory processing refers to the way the nervous system (brain) receives messages from the senses (body) and turns them into appropriate motor and behavior responses. Sensory processing is an unconscious activity of the brain that helps us complete our daily tasks and routines. Sensory Processing Disorder (SPD) is a “roadblock” between sensory input experienced by the body and interpreted by the brain. The brain does not appropriately receive messages from the body because of this roadblock. The messages may be unorganized, delayed, or stopped all together. If this happens, the body has difficulty interpreting information from sensory input. The body can then have an inappropriate response to the sensory input. 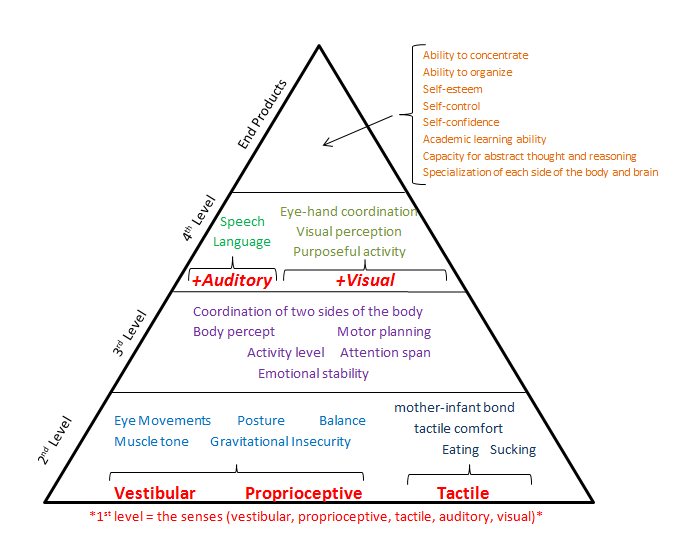 Sensory input refers to everything in our environment that we experience. When we see, hear, taste, or touch something, our brain tells us what we are experiencing and how to respond. Proprioception – The brain’s awareness of the body’s position in relation to gravity and the environment, specifically input to the joints and muscles. Vestibular – The body’s ability to process input from movement, specifically an awareness of the position of the head with movement. Tactile – The body’s ability to process all touch input to the skin, including temperature, pressure, and pain. Oral sensory – The body’s ability to appropriately process input through the mouth, including food and non-food items (sense of taste). Auditory – The body’s sense of hearing. Visual – The body’s sense of seeing, including input from light. Olfactory – The body’s sense of smell. Introspection – The body’s awareness of internal functions (such as temperature, emotions, etc.). Motor coordination is the ability to organize the body and complete simple or complex movements to effectively achieve a functional goal. Components of motor coordination include body awareness, balance, strength, using both sides of the body, and the ability to motor plan through a task. Motor planning is the ability to ideate (think of an activity), plan, and execute a movement. What are different ways motor coordination affects my child’s development? Motor coordination is responsible for the ability to learn novel skills and retain learned information. Difficulty with motor coordination can affect the development of a wide variety of skills, including (but not limited to) development of handwriting and academic skills, participation in ADL tasks, manipulation of objects in the hands, attention, and ability to participate in structured routines. Executive function is the mental processes required in order to successfully engage in activities of daily living. The skills include the ability to plan, organize, retrieve information from memory, manage time, problem solve, display self-control and mental flexibility. Children who have executive functioning deficits will exhibit difficulty initiating tasks, sustaining attention, following multi-step directions, staying organized, and planning ahead. Developing executive functioning is important in order to meet the demands of school, interact with peers and adults, and participate in play, leisure, and work. Occupational therapist can help assess executive functioning deficits and facilitate the therapeutic opportunities children require to develop the skills. Please contact a member of the Little Steps team for further information. Our occupational therapists work on utensil and cup use as well as a whole-body approach to picky eating. Through the use of positioning, sensorimotor play, environmental management, and oral motor skills through play and exploration children are encouraged to explore food in a stress-free environment. They will begin to tolerate foods from a distance and work at their own pace to touch, taste, and eat foods.